Let’s face it. A home cooked meal takes time. But what if your appliances took care of some of the cooking for you? Whirlpool’s new Fingerprint Resistant Smart Kitchen Suite helps take the guess work out of meal prep and takes the smart kitchen to a new level. With new Scan-to-Cook technology from Whirlpool , busy parents now have fewer steps to worry about when making dinner. Simply scan the barcode of your favorite frozen meal using the Whirlpool mobile app and the right settings and cooking instructions are sent directly to your smart range, microwave or wall oven. But what if you like your pizza extra crispy? You can customize the settings to remember your preferences. So my son can have his pizza crunchy every time. Often, dishes are a multi-step process. For instance, you might want to bake your macaroni and cheese, broil the bread crumb topping and then keep it warm. Rather than manually switching the oven, with the Whirlpool mobile app, you can send complicated three-step recipes directly to your appliance and it will follow the cooking directions automatically – so there’s no need for you to remember to change settings. Running late? That doesn’t mean your meal has to be delayed or ruined. Through the Whirlpool mobile app, you can preheat, start or stop cooking and adjust the oven temperature remotely. Whirlpool made the controls on their appliances easier to use, as well. 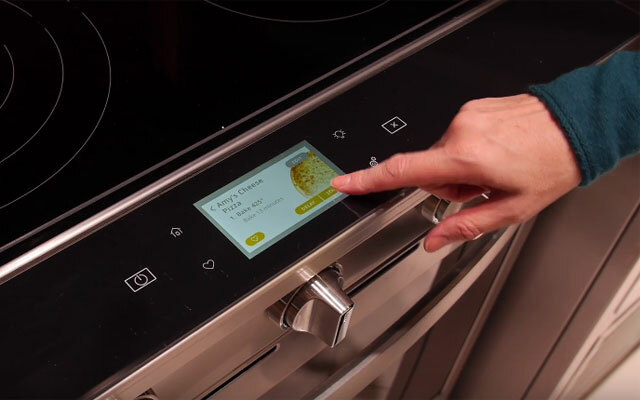 Each appliance has a full-color touchscreen, and proximity sensors adjust the size of the text to ensure you can read the display even when you’re across the kitchen. The volume of the timer will also rise as you move further from the appliance.